December brings out the baker in me. There isn't any other time of year that beckons one to spend so much time in the kitchen preparing wonderful confections. The abundance of sweet treats this time of year can be overwhelming....candies, cookies, cakes, pies, puddings, tarts....you name it and it appears. This year I am focused on making a good gingerbread. Being curious about the origin of gingerbread, I did a little research and learned that there is a lot of information about gingerbread and its medicinal uses, its use in affairs of the heart and as a treat! It wasn't until the 15th century that Gingerbread, as we know it, began to appear....breads, cookies, or houses flavored with ginger, honey, molasses and spices like cinnamon, nutmeg, cloves, cardamom and anise. Gingerbread was also a favorite treat at festivals and fairs in Medieval Europe. It is even said that Elizabeth I had gingerbread cookies baked in the likeness of visiting dignitaries! Can you imagine....? 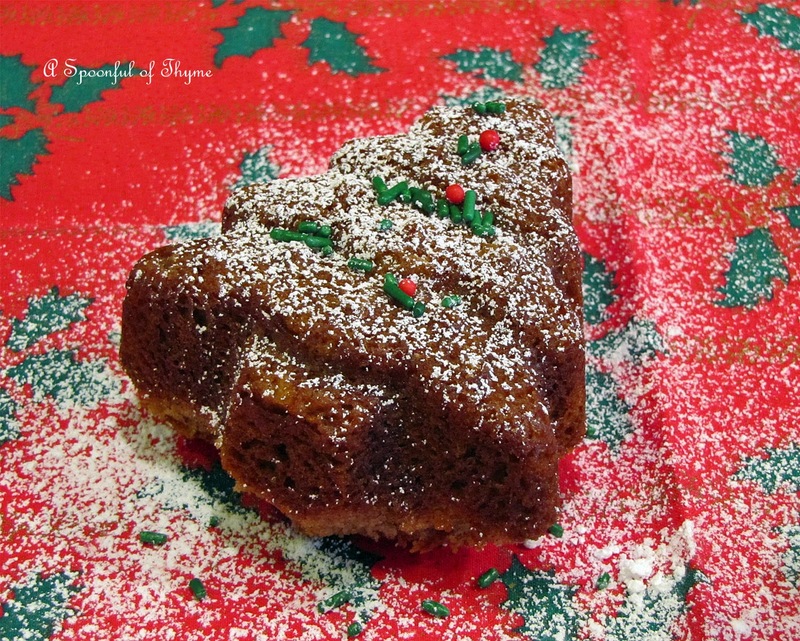 Each year, I seem to add another gingerbread recipe to the file but I never seemed to make it....until now. This is the year! I was swayed to do it when I saw some adorable Gingerbread Trees while visiting Marsha's blog, The Harried Cook. Swayed? I should say, sold! 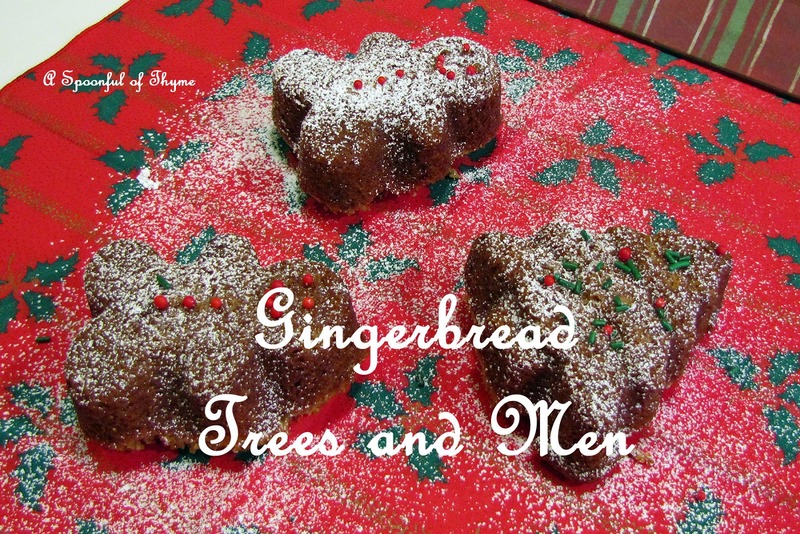 Of course, this meant that I had to buy a new pan...one cannot make adorable little Gingerbread Trees without the right pan....and, the pan I found had both trees and men therefore, I made Gingerbread Trees and Men! Fun times in the kitchen!! As you have guessed, it is time for The Secret Recipe Club post. Being assigned Marsha's blog has been fun... Marsha had been scribbling recipes on pieces of paper, napkins, notebooks, textbooks, mobile phone memos and attests to losing most of them which is why she began blogging. The blog assures that there is a recipe legacy for her daughters. As is evidenced by her blog, Marsha does love to bake and December is the month for baking...so, needless to say, I found a variety of recipes from which to choose. I had debated about baking her Chocolate Cupcakes with Whipped Ganache Frosting (and I may still make them....) but gingerbread was beckoning today. Grease the mold or pan with butter. In a medium bowl, sift together the flour, salt, baking powder, baking soda, and spices. Set aside. In the mixer bowl, cream the softened butter with the sugars until light and fluffy, about 3-4 minutes. Add the eggs, one at a time, beating after each egg before adding the next. Add the vanilla and mix into the mixture. With the mixer on low, add the flour mixture and stir until just incorporated. Do not over-mix the batter. Pour into the prepared pan or mold. Smooth the top using an offset spatula. Bake until the tester comes out clean, about 45-50 minutes for the loaf or if using the molds, bake for about 18-20 minutes. Allow the pan to cool for about 10 minutes and then turn the cakes out onto a plate. Allow to cool completely before dusting with confectioner's sugar. 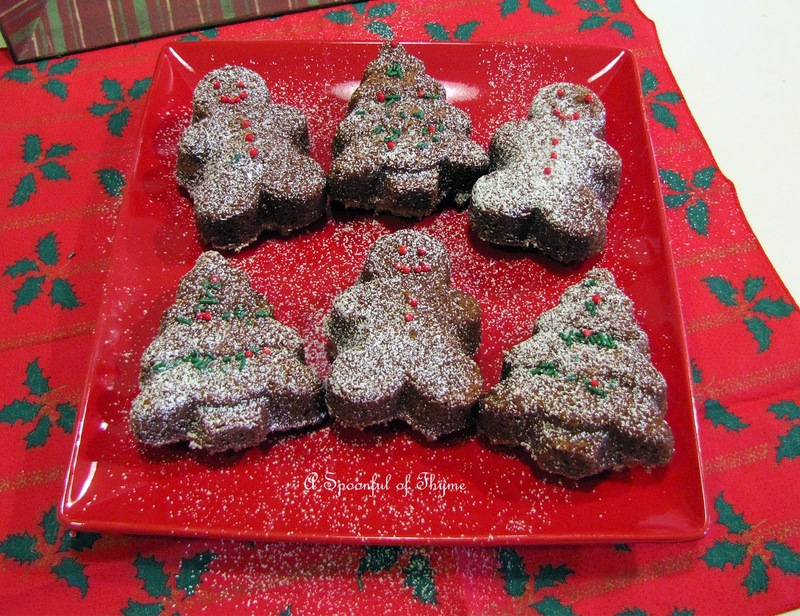 These cute little guys were a treat that I served at a recent meeting...they were a hit!! So cute and perfect for this time of year! I adore gingerbread and your little men are adorable! Your gingerbread men are adorable and I'm sure they were a great treat at the party. So cute! Great SRC choice! How cute and delicious! I don't have a formed pan like that - but I bet it would be just as tasty in a muffin tin. These gingerbread men are adorable. I was expecting cookies in this recipe, but the cake is even better. Great SRC post! These are so cute! A perfect Christmas treat. Visiting from SRC B! Happy Holidays. Hi Kate! Thank you for the kind words… glad you enjoyed the gingerbread. I love the way my house smells when these are baking. :) Merry Christmas!